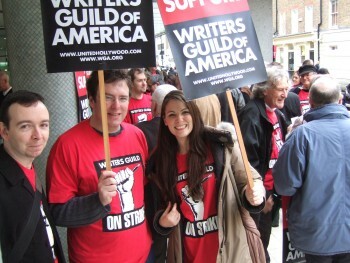 Writers’ Guild of Great Britain members (though outnumbered in this pic 2:1 by NUJ members) were out in force yesterday, to mark an international day of solidarity with the striking screenwriters of the Writers’ Guild of America. I managed to pop by for the end of it, after an exciting (no, really) team away day morning a few streets over. Nice atmosphere, with lots of people meeting friends and chatting. I think with such an atomised workforce, writers should really have demos every other week, just so the freelancers can meet other humans more often. Anyway, a very worthy cause, with a surprisingly decent turnout for the tail end of a demo (can’t comment how many were there whilst the main demo was going on, as I was so late, but it looked good on YouTube – I missed the slebs too) and nice to see our Transatlantic comrades’ campaign getting a bit of solidarity yesterday, all around the world. 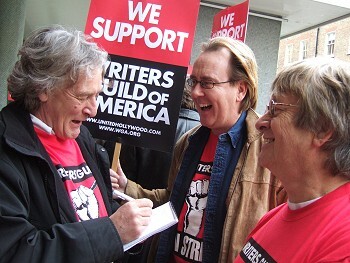 And thanks especially to Piers for the very fun suggestion that we send those naughty Hollywood cap-it-er-lists a box of pencils, to stand in for all the pencils that have been downed until the writers get a fair deal. I’ve added my 2B worth to the campaign, and passed on a boxful of sustainably forested scribble sticks to one of the six men who control the six media conglomerates. $1 well invested there – Let’s see how well they do at writing until their staff get back! Wilmington, DE (December 17, 2007) – Today, Sen. Biden received the endorsement of the Delaware Communications Workers of America (CWA), Local 13101. Sen. Biden thanked CWA Local 13101 and President Speakman for their continued support. “Because of the support of CWA and other unions, I was elected as the first pro-union United States Senator in Delaware history. Since then we have fought together for Common Situs Picketing in the mid-1970s, the prevailing wage, Card Check, OSHA standards, pension protections and, most recently, the Employee Free Choice Act. “History teaches us that when the union movement is strong, our middle class is strong. And when our middle class is strong, our country is strong. As president, I will immediately sign the Employee Free Choice Act into law. I will guarantee that the National Labor Relations Board returns to being a fair forum to contest unfair labor practices. I will appoint people to the Department of Labor who understand the value of unions to our economy and will make sure that pro-union officials play senior roles at the Departments of Commerce, State, Agriculture, Homeland Security and Health and Human Services. And I will also create good, union jobs by investing in our national infrastructure. We have $1.6 trillion of work to do to rebuild our roads, tunnels, ports and bridges. That means more construction, manufacturing, and transportation jobs for Americans.